Toyota Highlander, the midsize crossover SUV that was unveiled at the 2000 New York Auto Show, has been one of Toyota's best-selling SUVs for over a decade now, with the RAV4 as the only other SUV made by Toyota that is more popular and sells better. 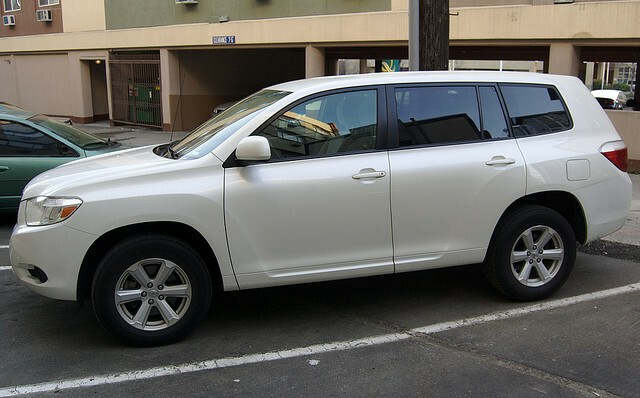 The Highlander is based on the Toyota Camry platform, and it's the first SUV that is based on a midsize car. So far, two generations of the Highlander have been launched, and the third one is ready to hit dealerships in 2014. It was unveiled earlier this year, at the New York Auto Show, and it will have a design that will be slightly different from previous generations, will be longer, wider and more spacious. As a publicity stunt, in efforts to get potential buyers excited about the third generation Highlander, Toyota has decided to join forces with Nickelodeon, launching a one-off Highlander that is inspired by one of the most popular cartoon characters, SpongeBob SquarePants. The face of this wacky character, that is loved by millions of kids all over the world, is featured on the vehicle's hood and doors, while inside the car you'll find yellow seats with SpongeBob's face on each headrest. The car's ceiling is blue, reminiscent of the ocean, SpongeBob's natural habitat. With this collaboration, Toyota is hoping that it will be able to take advantage of the popularity of SpongeBob SquarePants and make the Highlander appealing to potential buyers who have children who love this cartoon character. This Toyota Highlander with a SpongeBob SquarePants touch was unveiled on July 13 during the San Diego Padres vs. San Francisco baseball game, and it will go on a tour across the country in the next few weeks. As far as the vehicle itself, its performances and specifications, the 2014 Highlander comes with many improvements as compared to the first and second generation. The main difference is in the design, as it's now wider and longer. This has made the car more spacious and has provided enough room for third-row seats. Now, getting to the third-row seats can be done pretty simply and effortlessly, which wasn't the case with previous models, thanks to the sliding tip up chair that is located in the second row, and now there is enough room for 8 people. This way, it's easier for adults to access the third-row seats, while in the first and second generation, it could only be reached by small children. Thanks to the new grille and the redesigned front end, this generation Highlander looks sportier and more aggressive. The 2014 Highlander is powered by a 2.7-liter, 4-cylinder engine, with a 6-speed automatic transmission, and it is a front-wheel-drive vehicle. The engine will provide 187 horsepower and 186 lb-ft of torque. This means that there are no significant changes under the hood with regards to previous generations, at least as far as the base model is concerned. While no information has been revealed regarding safety features and the car's infotainment system, it's expected to be equipped with lane-departure warning system, as well as blind-spot monitoring and pre-collision warning systems.